The farmhouse cook was in a tizzy because a group of hungry hikers had turned up unannounced for lunch and half- way through their meal had gotten wind of the furtaies that we had ordered in advance. They wanted some, too. The fame of this cook’s light and fluffy funnel cakes had spread across the valley, and after a long walk through the wildflowers in the Dolomites, we weren’t into sharing. Furtaies (and its diverse Ladin spellings and many Germanic names – fortaies, strauben, stràuli, stràboli ) are a specialty of the Val Badia in the Dolomites, and are strongly linked to the traditional Ladin culture. The main ingredients – milk, butter, eggs, and flour – are commonly produced on the small farms, while grappa keeps the winter cold at bay. Like many traditional desserts, furtaies in the Ladin area of the Dolomites are linked to a special occasion, the engagement of a young couple. Traditionally, the groom-to-be goes to the house of the bride-to-be where the engagement is announced, wedding plans are discussed, and a huge batch of furtaies are made. In the meantime, other young men, possible suitors of the bride-to-be, stealthily go about trying to steal the furtaies, which, the locals recount, is hilarious fun. Perhaps you had to be there. Furtaies have traveled far and wide, and not only when they were stolen. The Dolomites were part of Austria until after World War I, when the borders were redrawn in 1919, and they became part of Italy. So, this sweet appears to have its roots in Austria and was also common in Switzerland and Germany. 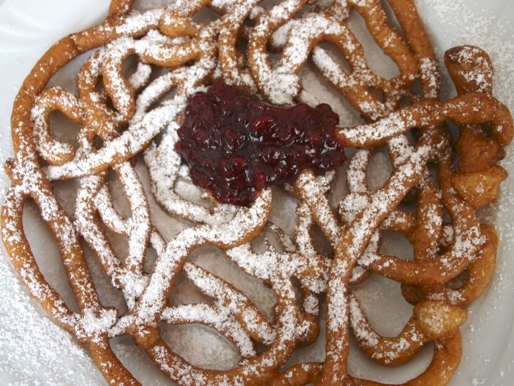 When German immigrants settled in Pennsylvania in the 18th and 19th century, they brought this sweet with them, and it became known as a funnel cake in the Pennsylvania Dutch area. This has nothing to do with Holland, as “Dutch” was an apparent corruption of the word “Deutsch”, meaning German. But enough about history- how’s the furtaies-making going? The cook was frantically adding eggs and milk to the furtaies batter, mumbling about having to make 40 of them instead of 25, then added a glug or two of grappa. 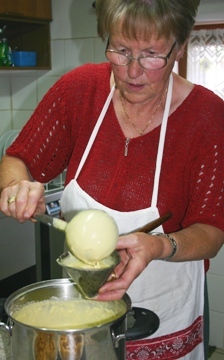 She mixed and ladled the mixture back and forth, peering at it to determine when it was of the “right” consistency. In the midst of this, I dared to stand at the edge of the kitchen asking her about amounts to try to get an approximation of a recipe. I also saw that she had a special funnel with a long handle that was made just for furtaies and she took a moment to show it to me. Then she shrieked when she realized the pan of oil on the stove had gotten too hot, so I wisely retreated to my table. Making the cook nervous was putting all our furtaies in jeopardy. To stave off any further badgering of the cook, the waitress brought me a cookbook (in German) with a recipe for strauben. Fellow hiker Robert Gardos translated it for me and I scribbled the recipe on the back of a hiking map. Once back home I compared it to other Italian funnel cake recipes on the internet, and found they were all very similar, though a few added some sugar to the batter and a couple had added baking powder as a leaving agent. They all contained grappa or acquavite. I admit that every time I’ve eaten furtaies in the Dolomites, I’ve been famished after a long walk on our Wildflowers in the Dolomites tour, which may make them taste better then they actually are. To test this theory, I tried making furtaies at home after I skipped lunch, and while they were good, they weren’t as good as the ones I ate at the Ciablun farm. I used sour cherry jam as the condiment, rather than the red bilberry jam of the Dolomites, and that offered the right tart contrast, but my furtaies were crispy, while the ones I had at the Ciablun farm were a fragrant light dough, with a slightly chewy consistency. 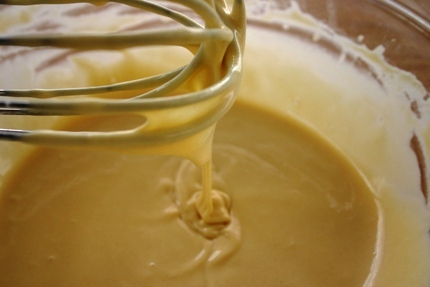 I phoned the farm to find out if there was any leavening in the batter. “Yes, a little” I was told. Further quizzing resulted in finding out that the leavening was fresh yeast (not baking powder), but “a little” was as precise an answer as I could get. So, the next time I make furtaies, I’ll add a little yeast. 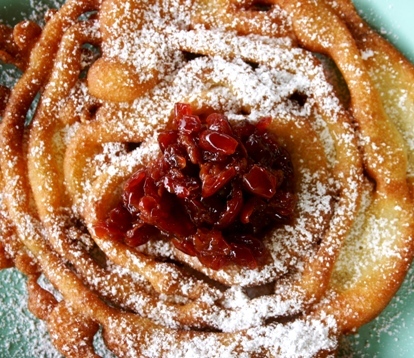 For my crispy furtaies, try this funnel cake recipe.